When Claire Langdon's affluent, near-fairytale life in New York is shattered by scandal, she and her eight-year-old son Jamie take refuge with her grandmother in Florida. Once a bright, confident young woman, Claire has been so badly hurt that when she stumbles onto a genuine downhome hero, learning to trust, to love again, seem beyond her reach. She is also forced to deal with the discovery that there are more serious dangers in Florida than alligators, snakes, spiders, and macho males. Like a serial killer, with her name on his list. Brad Blue is the son of a Russian defector (from Cold War days); his mother, the daughter of one of Florida's wealthiest cattle barons. (And, yes, Florida is the largest cattle-producing state east of the Mississippi.) Still under forty, Brad is retired from one of Uncle Sam's many secretive "alphabet" agencies. He's tough and lonely and more than ready to settle down to family life, but convincing Claire Langdon to marry him is one of his most difficult assignments. Almost as difficult as discovering the identity of the killer who is stalking female real estate agents in Calusa County, Florida. From the moment Claire and Brad meet in the midst of a flooded bridge, cultural shock wars with romantic attraction. On top of that, they both have pasts that don't bear close scrutiny. But when Brad offers Claire the job of "sitting" one of his model homes out back of beyond, she accepts. Which is just fine with the killer. The killer plays a prominent, if anonymous, role throughout the book, gloating over his kills, attempting to justify them. And finally meeting Claire, face to face. 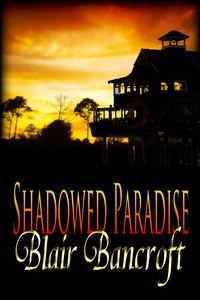 "Marvelously versatile, wondrously creative, intelligently written and sensuously inventive, Bancroft's Shadowed Paradise adds new meaning to the term 'romantic suspense.' . . .as fresh as tomorrow and seriously scary. I loved it." "Shadowed Paradise contains all the elements I so enjoy in a book, excellent dialogue, great character development and fine descriptive scenes. The romance is steamy, the suspense is taut and exciting, and the result is a supremely satisfying, well-developed read, guaranteed to keep you glued throughout."